Nice Ride Minnesota, the Twin Cities bike-sharing program, is calling 2013 its breakthrough year. The service has so far counted more than 300,000 rides during its 2013 season, up about 9 percent from a year ago, as it added 24 new stations tied to the Mississippi National River and Recreation Area, the Hiawatha Corridor and Lake Street in Minneapolis. "We have had a pretty big milestone in terms of usage," Nice Ride Marketing Director Anthony Ongaro said. "And we're looking forward to more for next year." The program now has 170 stations. It also has added 350 bikes, bringing the total to 1,500. It also kicked off its greater Minnesota initiative to look for cities interested in adding the program. A pilot program in Bemidji is set to launch in spring of 2014. The city approached organizers to make that happen. "There are certain qualities that we're looking for in terms of how bikeable a city already is, and the kind of work that they've done to create an atmosphere of a 'bike place,'" Ongaro said. "What we're looking to do is really look for cities that have already made that commitment, and then allow us to really help expand that and continue it from there." Nice Ride is also planning to bring the program to other cities in greater Minnesota. Launched in 2010, the program is "mainstream and here to stay," Nice Ride Minnesota Executive Director Bill Dossett wrote recently. "Across America, young people are moving to urban centers, driving less, and walking and biking more. For the first time since highways were invented, we are seeing a reduction in total vehicle miles traveled." He called 2013 a breakthrough year because the Minneapolis bike sharing experiment has taken root in New York City, Chicago and San Francisco "with amazing success." "Those major cities adding systems very similar to ours was a major boost in the awareness of what bike share is and how the industry works," Ongaro said. The program aims to expand in the Twin Cities by adding more stations within the core use areas, primarily in downtown Minneapolis, to make the system easier to use, he said. "We're looking to really create that kind of network where people can really depend on it to get wherever they're going, without having to walk too far away after they've reached their destination," Ongaro said. The top use for the system is transportation — getting to and from work or school, Ongaro said. But this year, there was a slight rise in recreational use after the addition of a station at Lake Street and Knox Avenue South in Minneapolis, along Lake Calhoun. That station is now the third most popular in the Twin Cities. The most popular station is at the IDS Center in downtown Minneapolis with more than 10,000 trips originating from there this year, followed by 100 Main Street SE station, with more than 8,500 trips. The recent additions of bike lanes and bike paths in the metro area may be correlated to the bike share system, Ongaro said. "There have been incredible changes in the Twin Cities over the past four years," Ongaro said. 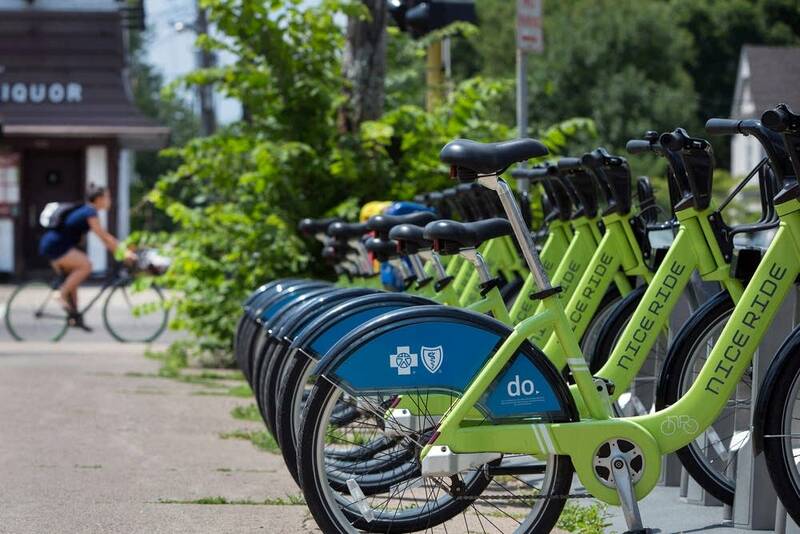 "Those are some of the developments you see when you add a bike sharing system to the city." He said the same could happen in greater Minnesota with the expansion of Nice Ride. "I think what tends to happen sometimes is you get a chicken-or-the-egg situation, where people say, 'Well, we don't want to do bike sharing because there isn't enough bike infrastructure,'" Ongaro said. But, he said, "you bring in bike sharing, you create more cyclists, and then the infrastructure follows." Riders either purchase a 24-hour subscription, or an annual $65 subscription. Cooler weather around the corner will end bike sharing on Nov. 3. It will resume in the spring.